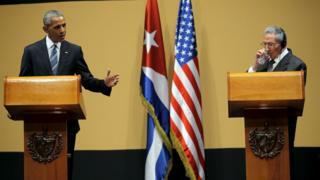 Mr Obama said change would happen in Cuba and that Cuban President Raul Castro understood that. The two leaders met to talk about trade and held a joint news conference. Mr Castro denied that there are political prisoners in Cuba, telling journalists to "give him a list" and then they would be released "tonight". He also defended Cuba's record on human rights and pointed to problems in the US. "We defend human rights, in our view civil, political, economic, social and cultural rights are indivisible, inter-dependent and universal," Mr Castro said. "Actually we find it inconceivable that a government does not defend and ensure the right to healthcare, education, social security, food provision and development." Mr Obama said the trade embargo would be fully lifted in Cuba, but he could not say exactly when. "The reason is what we did for 50 years did not serve our interests or the interests of the Cuban people," he said. Why is the visit groundbreaking? For a US president to touch down at Jose Marti airport in Havana and be warmly greeted by Cuban's foreign minister was until recently unthinkable. Media captionPresident Obama's visit is the high point of a recent easing of ties, which included the opening of embassies last year. For decades, the US and Cuba were engaged in a bitter stand-off, triggered by the overthrow of US-backed Cuban dictator Fulgencio Batista by Communist leader Fidel Castro in 1959. The US broke off diplomatic relations and imposed a trade embargo. But President Obama undertook two years of secret talks which led to the announcement in December 2014 that the two countries would restore diplomatic relations. Since then, there have been a series of symbolic moments, such as the first formal meeting of Presidents Obama and Castro at a regional summit in Panama and the opening of embassies in Havana and Washington DC. What have been the highlights of the visit so far? Presidents Obama and Castro shook hands at the Palace of the Revolution in Havana ahead of their bilateral meeting on Monday. They seemed visibly more relaxed than at their first official meeting at a regional summit in Panama just under a year ago and smiled broadly. Following his arrival on Sunday, the first stop on President Obama's tour had been the newly re-opened US embassy in Havana, where he told staff it was "wonderful to be here". But it was the visit to Havana's old town which brought home the long way US-Cuban relations have come since the thaw was announced 15 months ago. While the plan to interact with Cubans in the streets was disrupted by a tropical storm, the image of the US president and his family braving the rain demonstrated to many Cubans his commitment to the new, warmer relationship. The two leaders' meeting at the Palace of the Revolution will be closely scrutinised for signs of how much practical progress has been made. Ahead of the meeting, President Obama said he believed that "change is going to happen here and I think that Raul Castro understands that". He also told US broadcaster ABC that he would be announcing that Google had made a deal with the Cuban authorities to expand Cuba's poor wi-fi and broadband access. There have been a series of other agreements between the two countries since the thaw was announced, including commercial deals on telecoms and a scheduled airline service, increased co-operation on law enforcement and environmental protection. Many Cubans are hoping their economy will receive a further boost from further openness and reforms as well as US investment. Cuban officials are banking on a growth in US tourists visiting the island as restrictions on US citizens travelling there are eased further. On Sunday, US hotel company Starwood announced it had become the first US firm to agree a deal with the Cuban authorities since the revolution of 1959. The company said it would be making a "multimillion-dollar investment" to bring three Cuban hotels "up to our standards". While President Obama's agenda was carefully discussed with Cuban officials, one thing the White House has insisted on is a meeting between the president and Cuban dissidents, whether the Cubans like it or not. Among them are expected to be members of the Ladies in White, a group which campaigns for the release of political prisoners. Media captionWho are the Ladies in White? Only hours before Mr Obama touched down, dozens of their members were arrested during their weekly protest in Havana. The meeting between the dissidents and Mr Obama is scheduled for Tuesday. Another main sticking point between the two countries is the 54-year-old US trade embargo. While strolling through Havana's old town on Sunday, one Cuban shouted: "Down with the embargo!" The problem for Mr Obama is that it can only be lifted by the US Congress, which is controlled by Republicans who have expressed their opposition to its removal. On the Cuban side, analysts say there are conflicting sentiments within the Communist Party over hosting Mr Obama. The Director General of the US division at the Cuban Foreign Ministry told the BBC's Will Grant that "matters of sovereignty of the Cuban people" would remain firmly off the agenda. Media captionJosefina Vidal: "Matters that are internal decisions and sovereignty of the Cuban people will not be negotiated with the United States"
Many observers have also noted that Mr Obama is not scheduled to meet Raul Castro's older brother, the leader of the Cuban revolution, Fidel Castro. The elder Castro has only made one official statement about the thaw in relations, and it was hardly a ringing endorsement: "I don't trust in the United States' policy, nor have I exchanged a word with them".